Many museums struggle with maintaining a good balance of technology – enough to attract (and keep the attention of) younger crowds, but not so much that visitors who go to museums to “unplug” are unable to do so. 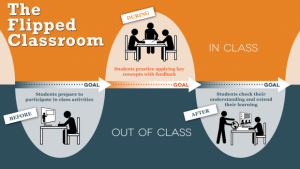 The best solution is to give visitors options. They can sign up for the facebook and the instagram feeds; they can walk past the video touch screens. Museums Gone Viral brings you real ways that museums have used technology and the internet to reach a variety of visitor groups. A few weeks ago in the Tufts course Museums and Digital Media, we were treated to a fascinating discussion with Jim Olson, Director of Integrated Media at PEM. 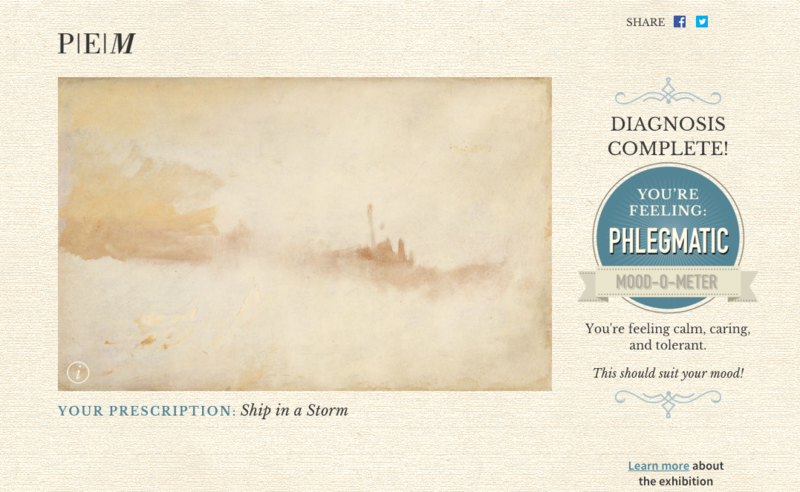 Among the many examples of digital media at the museum was an interactive piece created for the “Turner and the Sea” exhibition in the summer of 2014. The exhibition focused on Joseph Mallord William Turner’s work and his multitude of work focused on different depictions of the sea. 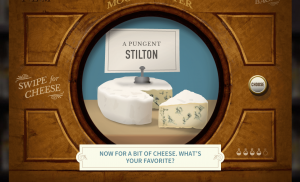 Turner has such a wide variety of emotions poured into his work, some more abstract than others, that the PEM team decided to create a “period-appropriate” apothecary website. The site takes you through a series of questions and choices based on your mood, and then spits out a Turner painting that might match your current feelings. I think this is a great way to get people more involved in the exhibition, and I love that you can access it at home as well as in the exhibition (when it was up, the space included ipads that hosted the site). The Mood-O-Meter is fun and slightly cheeky, which makes you want to use it again and again, finding a Turner piece for every mood you might have. Beyond the amusement, it dives deeper into Turner’s painting methods, asking users to pick a color of paint that they feel drawn to and explaining how it was created or used. 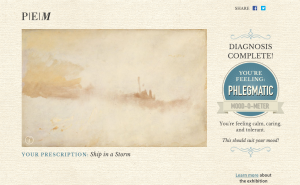 The website fosters a feeling of personal investment in the painting – after all, your mood might be close to Turner’s when he painted it, or perhaps to the mood of the sea on that day, and it creates a desire for visitors to take a closer look at the painting and spend more time with it. You can even access the Mood-O-Meter at any time, even though the exhibition closed over a year ago. 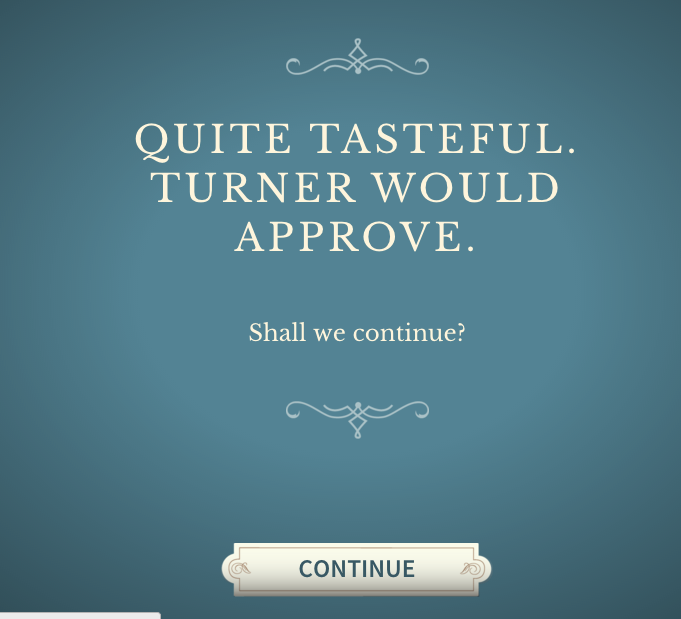 If you know that the website is there, you can continue exploring Turner and his artwork for as long as you please. Check it out here. 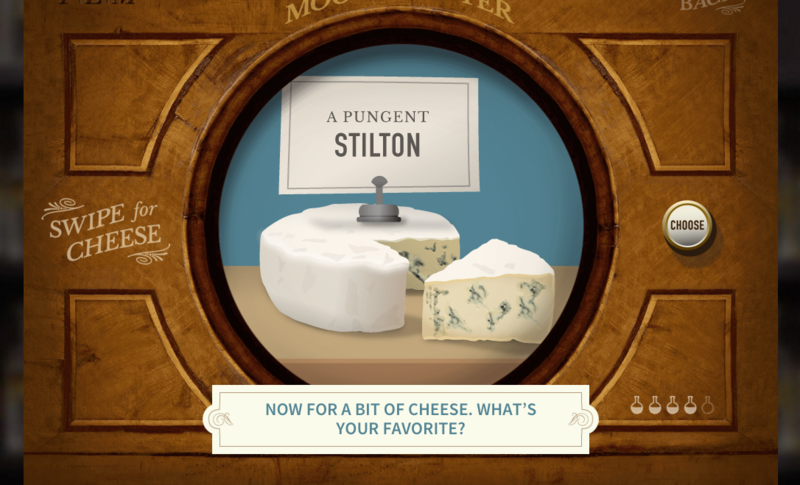 Playful and funny, the Mood-O-Meter even has you choose your cheese preference before telling you about Turner’s own love of cheese. I have to say that I did enjoy it, probably more than I would have if I was just encountering the painting on my own. I don’t generally like or truly appreciate works of art that are more abstract, but I found myself looking more closely at the chosen painting for ways to connect my mood with the piece. 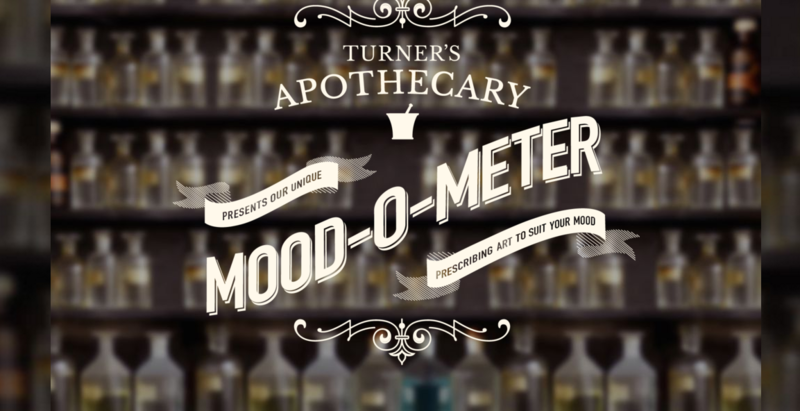 If you want to know more about how the Mood-O-Meter came about, check out this discussion with creators Jim Olson and Caroline Herr. Chicago, well known for its plethora of outdoor art, has recently stepped up its art game. This summer, statues all over the city began to talk. People can find a statue, like that of Abraham Lincoln and Cloud Gate (the big bean), with a plaque next to it, and wave their phone over the text. They then receive a phone call “from” that statue (which shows up on the caller ID) to hear it talking to them. Anyone with access to a smartphone can engage with the usually taciturn statues. The audio covers everything from silly stories to serious monologues. The best part about the project, which will last about a year, is that it’s totally free – minus the need for a smart phone – and very community centered. The words of the statues were completely written by Chicagoans. Other local famous folks, such as producer Shonda Rhimes and actors Steve Carrell and David Schwimmer, lend their voices to the project. The statues have been bringing together people who pass by and wonder what the big attraction is. As Colette Hiller, artistic director of the company that created the project, explains, “It’s different from an audio guide. It’s more personal; it takes you by surprise.” This is an interesting thought. The project has roughly the same format as a traditional audio guide – visitors come to an object they want to know more about, are instructed on how to access the audio, and use an electronic device to listen to information on that object. Despite that fact, the mere idea of the audio being more interesting and engaging is seen as being somehow above a regular audio guide. It brings to mind interesting audio guides completed by people like Allison Dufty, who writes fascinating audio guides for a wide variety of audiences and museums. I would be interested to hear what the talking statues project is considered, if not an audio guide. If you are around Chicago, particularly as the holidays are coming up, head out to any number of places to get a call from the lions outside the Art Institute or the Tin Man from The Wizard of Oz. Let us know what you think! 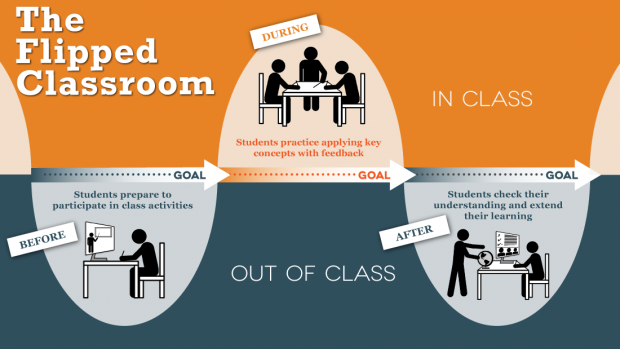 Is it worth the effort? Would you consider it an audio guide? Keep your eyes open around Boston – it’s been reported that the same company who created the talking statues in Chicago are considering Boston as one of their next locations! I would love to hear the story that the ducklings in the Boston Public Garden have to tell.